Michael O’Neill insists Northern Ireland - and recalled Wigan Athletic striker Will Grigg - will benefit hugely from the new UEFA Nations League. Northern Ireland host Bosnia & Herzegovina in Belfast on Saturday in the new-look tournament which is designed to add a more competitive edge to regulation ‘international friendlies’. Including promotion and relegation, the Nations League will provide an additional four places available for the European Championships via play-off games. And O’Neill - himself a former Latics midfielder - believes it’s a worthwhile initiative. “I think it’s probably better for smaller nations like ourselves in the sense of it’s very difficult to organise friendlies with the calibre of this,” he said. “It’s expensive to try and do it as well. “The fact we are in competition now, which has the reward of a promotion-relegation situation. “But it also has the route to Euro 2020 as well which is a good thing. “We are happy with the format, we look forward to the games. 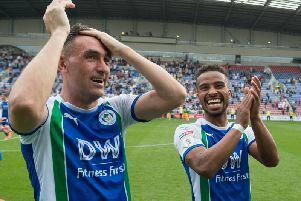 Latics striker Grigg is back in the fold after a fine start to the campaign, and hoping to get on the field in green and white for the first time since November 2016. But opponents Bosnia & Herzegovina will provide a stiff test of Grigg and Northern Ireland, as they look to bounce back from the heartache of missing qualification for the World Cup in Russia. “It will be a tough game, there is no doubt about that,” added O’Neill. “They were unlucky to miss out on a play-off spot for the World Cup finals, like ourselves. Northern Ireland also play Israel next Tuesday in Belfast in an orthodox friendly before Grigg rejoins with his Latics colleagues at Euxton.